This entry was posted on April 27, 2008 at 4:29 am	and is filed under Jordan, Meetings, Railroads, St. Johns, Villages, Welland Canal. 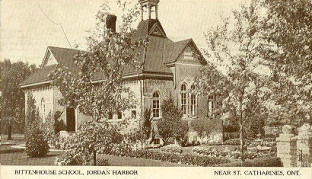 Tagged: Jordan Harbour, Miller's Bay, Mills, Post Offices, Railroads, Shipyards, Silverdale Station, St. Johns, Villages. You can follow any responses to this entry through the RSS 2.0 feed. You can leave a response, or trackback from your own site. The correct spelling of a Thorold pioneer is Benjamin Canby. My research into the vanished village of St. Johns indicates only one woolen mill, only one school at any one time, only one lumber mill, and no brickyard. Some structures did indeed use brick, but these were obtained elsewhere. Hard to find mention of the fracas that took place at St Johns in the middle of the night in June, 1838. The village was a hotbed of discontent with the government, and about 10 cavalry soldiers were stationed there to keep and eye on things. Three groups of rebels, some Upper Canadians, some Americans, attacked and captured the soldiers. The soldiers were eventually released, and the rebels fled. All were caught. Some were sentenced to deportation to Van Diemen’s Land, and one was hanged at Niagara. The village wasn’t always as peaceful as it is now. My Grand Father was an employee of the old NST railroad and was a conductor.I find it interesting nothing much here on the railroad.I suppose Art Smiths estate must of had something in memorabilia as he worked with John Thomas Bartley my grandfather.Looking learning. John Street ran a grist mill in the valley below the cemetery. The mill’s still there, with much of the gear from the 1880s. His house is nearby, one of the very few surviving domestic buildings. It has been added to over the years, and is now being used as an educational facility. Street’s mill dam can be easily spotted from the valley road.